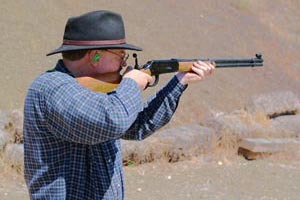 The Coyote Valley Sharpshooters host their Cowboy Long Range match every 4th Saturday of the month all year round, January through November weather permitting. The location for this fun shoot is at the Santa Clara County Field Sports Park, located south of San José, California. All Cowboys and Cowgirls are invited to participate. This is a rifle match only please leave your handguns and shotguns at home. Safety meeting at 09:00 followed by the match. The match concludes no later than 15:00. If there is time after the match, the range will be available for practice. 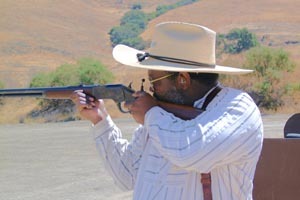 Capt Buffalo with repro '73 Winchester. His Honor, Former CVS Mayor Prof Cubby Bear with his pre-64 Model 94 Winchester in .30-30 WCF. Period cowboy dress please. Period Cowboy costume circa 1865-1900 is required . This can range from the simple (jeans, long-sleeved western shirt and cowboy hat) to the elaborate (hand-sewn costume including accessories). If in doubt, call us and ask. 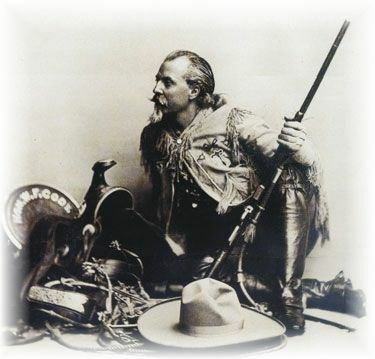 Rifles are limited to original or reproductions of pre 1900 rifles found in the western USA, Mexico, Cuba, or Canada during the cowboy era, roughly 1870 to 1900. Any firearm that is visually similar to an original may be used. Lever or pump actions chambered for pistol caliber cartridges, i.e. 44-40, 38-40, 32-20, 25-20, 45 colt, etc. Rifles Winchester 66, 73. 92, 94, Marlon 94, Colt Lightning, etc. Single shots Trapdoor, Sharps, Remington Rolling block, H&R, Browning. Stripper clips not allowed. Modern bolt actions model 70s, Ruger #1s, Browning BLR, etc are not allowed. Course of fire for each event is one sighter and 10 rounds for the record. Shooter will be timed, and the winner will be the shooter with the most hits. Ties settled by time. Shooting is at 50, 100, and 200 yards. Image above: Becky Brave with her "Teddy". Becky is shooting a 1896 Krag Jorgensen carbine, named after Teddy Roosevelt. The Rough Riders, his volunteer cavalry regiment, carried these rifles up San Juan Hill in the Spanish American war in 1898. 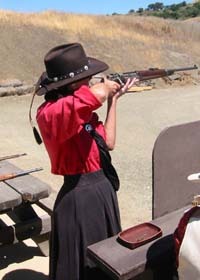 Becky's rifle was made in 1896, and still shoots very well, as does Becky. The Krag design is only one of the many fine things the USA has received from our pals in Norway. From the North: Take highway 101 or 85 south and exit at Bernal road. Follow the signs to Monterey Highway, and turn left/south on Monterey Highway. After 1.3 miles turn left on Metcalf road. Go over Highway 101 and turn right on Malech road . Range entrance is one mile on your left. Follow the sign to the parking for the 200 yard range. From the South: Take Highway 101 north and get off at Bernal road. Turn left/west on Bernal and go under both 101 and 85. Follow the signs to Monterey Highway, and turn left/south on Monterey Highway. After 1.3 miles turn left on Metcalf road. Go over Highway 101 and turn right on Malech road. Range entrance is one mile on your left. Follow the sign to the parking for the 200 yard range.